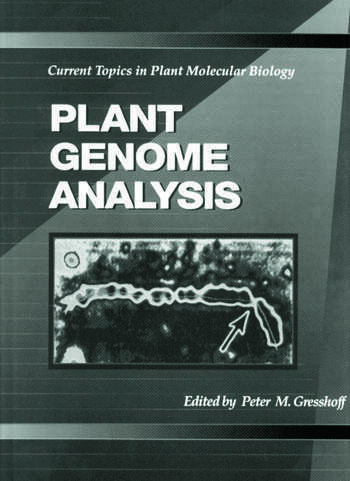 Plant Genome Analysis presents outstanding analyses of technologies, as well as explanations of molecular technology as it pertains to agriculture. Advances in genome analysis, including DNA amplification (DAF and RAPD) markers, RFLPs, and microsatellites are reviewed by accomplished scientists, many of whom are the developers of the technique. Articles by patent lawyers experienced in plant biotechnology present the legal viewpoint. importance of cell cycle genes in plants. Other chapters focus on specialized topics of genome analysis. These include a description of antisense technology in the study of photosynthesis and a comprehensive review of the characterization and isolation of plant telomere, including their use in varietal discrimination. A detailed anaysis of cytoplasmic male sterility in the french bean that focuses on the mitochondrial genome is described. The book provides a chapter on the production of yeast artificial chromosomes (YACs) carrying soybean DNA. Genes of the cell cycle in plants and their importance in developmental processes are presented, as well as detailed chapters on the molecular mapping of trees (apples and pines), and nodulation-related genes in legumes. A comprehensive index and a complete glossary are included. Genome Mapping and Agriculture (R.C. Shoemaker, L.L. Lorenzen, B.W. Diers, and T.C. Olson). Usefulness of Plant Genome Mapping to Plant Breeding (F.L. Allen). Technology for Molecular Breeding: RAPD Markers, Microsatellites, and Machines (J.A. Rafalski, M.K. Hanafey, S.V. Tingey, and J.G.K. Williams). Multiple Arbitrary Amplicon Profiling Using Short Oligonucleotide Primers (G. Caetano-Anollés, B.J. Bassam, and P.M. Gresshoff). Length Polymorphisms of Simple Sequence Repeat (SSR) DNA as Molecular Markers in Plants (P.B. Cregan, M.S. Akkaya, A.A. Bhagwat, U. Lavi, and J. Rongwen). Approaches to Mapping in Horticultural Crops (N. Weeden). FISH, DNA Amplification Markers and Conifers (J.E. Carlson, Y.-P. Hong, G.R. Brown, and J.C. Glaubitz). Molecular Exploitation of Soybean Genetic Resources (L.O. Vodkin). Molecular Mapping of Soybean Nodulation Genes (P.M. Gresshoff and D. Landau-Ellis). Plant Telomeres as Molecular Markers (A.M. Kolchinsky and P.M. Gresshoff). Plant Yeast Artificial Chromosome Libraries and Their Use: Status and Some Strategic Considerations (R.P. Funke and A.M. Kolchinsky). Duplicate Loci in Soybean: Characterization of the sle and A071 Loci (K.M. Polzin, E.S. Calvo, T.C. Olson, and R.C. Shoemaker). Antisense RNA Inhibition of Photosynthetic Gene Expression (S. Rodermel, C-Z. Jiang, D. Kliebenstein, and J. Qian). Organization and Expression of Mitochondrial DNA Sequences Associated with Cytoplasmic Male Sterility in Phaseolus vulgaris L. (C.D. Chase and M.J. Bassett). Cell Cycle Genes and Their Plant Homologues (J. Deckert, N. Taranenko, and P.M. Gresshoff). The Basics of the Patent Process (L. Terlizzi). Recent Cases and Legislative Initiatives Pertaining to Biotechnology (R.H. Kjeldgaard). Patenting DNA: Is There a Bull in the China Shop? (L.L. Greenlee). Glossary. Index.